Paul King (born 20 November 1960) is a British-Irish singer, musician, VJ and TV presenter. Paul King was born in Galway, County Galway, Ireland and moved to Coventry, England, with his parents at a young age. After graduating from Coventry Drama School, King considered joining the West Midlands Police, but joined rock-ska band, the Reluctant Stereotypes. King's line up of the band – which also contained record producer Paul Sampson – released an album The Label and three singles Confused Action, Plans For Today and Nightmares in the early 1980s on the back of Coventry's vibrant 2 Tone ska scene. After the demise of the Reluctant Stereotypes, King formed the Raw Screens who perfected their act and style to what King and his manager Perry Haines called 'multi-tone', and then in 1983 relaunched the group as self-named 1980s band King. As lead singer, King was famed for his cockatoo haircut and spray painted Doc Marten's Boots – a look described "like the Child Catcher from Chitty Chitty Bang Bang. But, hell, the girls loved him," while Richard James Burgess produced and drummed on most of the band's songs. The band lasted just a couple of years, though both of their albums, Steps in Time and Bitter Sweet, went Gold, and they had two Top 10 singles with "Love & Pride" and "Alone Without You". Paul King then went solo with a 1987 album entitled Joy, produced by American musician Dan Hartman. It produced the UK Singles Chart minor hit single, "I Know". 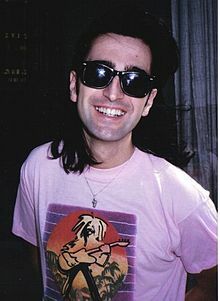 After an unsuccessful solo career, King became a VJ on MTV in 1989, before moving over to VH1 in 1994, and then became known for his infomercials on 1980s collection albums. He is mostly remembered for the programmes MTV's Greatest Hits, 120 Minutes and XPO, later renamed First Look. First Look, programmed by Richard Godfrey, Peter Good, Peter Ruppert, showed new singles and album releases and it was presented by VJ Paul King until 30 July 1994. In 1998, a joint King & Paul King 18-track collection, entitled The Best of King – Love & Pride, was eventually released, with hit singles, stand-out tracks, B-sides and remixes. Paul King still works for MTV Networks Europe where he has produced shows for VH1 and MTV. Except where otherwise stated, all are releases by the band King. 8 October 1984 – "Won't You Hold My Hand Now"
^ a b c d e Stirland, Jane (1 October 2014). "Look: Backbeat: Reluctant Stereotypes 'the nearly men' of Coventry's Ska scene". ^ a b c "Paul King". TrouserPress.com. Retrieved 7 January 2007. ^ "BBC - Coventry and Warwickshire - Entertainment - Pop into the Past". ^ "Coventry Telegraph: Coventry news, sport, lifestyle and events". coventrytelegraph. ^ "Paul King Fansite – XPO / First Look". Archived from the original on 2 January 2014. ^ "Paul King Fansite – MTV Europe 1993–1994". Archived from the original on 24 July 2011.